In November 2016, the EMA approved elafibranor’s Pediatric Investigation Plan (PIP) . In February 2017, the company expected to obtain conditional marketing authorization for elafibranor in NASH during the course of the second half of 2019 or first half of 2020 . GFT505 is a novel PPAR modulator that shows a preferential activity on PPAR-α and concomitant activity on PPAR-δ. Elafibranor (GFT505) is a dual PPARα/δ agonist that has demonstrated efficacy in disease models of nonalcoholic fatty liver disease (NAFLD)/NASH and liver fibrosis. In the rat, GFT505 concentrated in the liver with limited extrahepatic exposure and underwent extensive enterohepatic cycling. Elafibranor confers liver protection by acting on several pathways involved in NASH pathogenesis, reducing steatosis, inflammation, and fibrosis. GFT505 improved liver dysfunction markers, decreased hepatic lipid accumulation, and inhibited proinflammatory (interleukin-1 beta, tumor necrosis factor alpha, and F4/80) and profibrotic (transforming growth factor beta, tissue inhibitor of metalloproteinase 2, collagen type I, alpha 1, and collagen type I, alpha 2) gene expression. Ratziu V, et al. Gastroenterology. 2016, 150(5):1147-1159.e5. Staels B, et al. Hepatology. 2013, 58(6):1941-52. Elafibranor (code name GFT505) is a multimodal and pluripotent medication for treatment of atherogenic dyslipidemia for an overweight patient with or without diabetes. It is an oral treatment that acts on the 3 sub-types of PPAR (PPARa, PPARg, PPARd) with a preferential action on PPARa. As of February 2016, elafibranor has completed 8 clinical trials and a phase III is in progress. Elafibranor (INN, code name GFT505) is an experimental medication that is being studied and developed by Genfit for the treatment of cardiometabolic diseases including diabetes, insulin resistance, dyslipidemia, and non-alcoholic fatty liver disease (NAFLD). Elafibranor is a dual PPARα/δ agonist. FT505 is an oral treatment that acts on the 3 sub-types of PPAR (PPARa, PPARg, PPARd) with a preferential action on PPARa. It has a sophisticated mechanism of action. It is able to differentially recruit cofactors to the nuclear receptor, which subsequently lead to differential regulation of genes and biological effect. 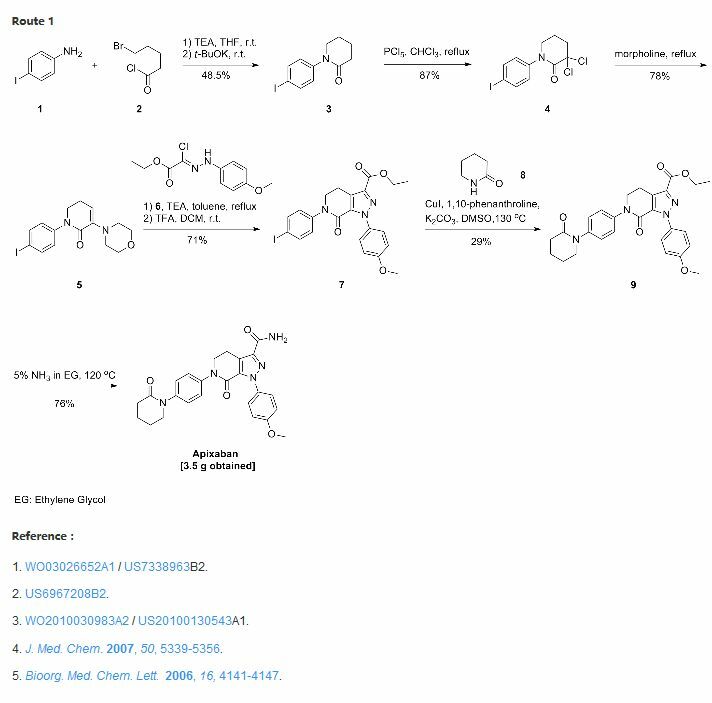 Therefore, the ability to identify and profile the activity of selective nuclear receptor modulator (SNuRMs) is a powerful approach to select innovative drug candidates with improved efficacy and diminished side effects. These pluripotent and multimodal molecules have significant positive effects on obesity, insulin-resistance and diabetes, atherosclerosis, inflammation, and the lipid triad (increasing of HDL cholesterol, lowering of triglycerides and LDL cholesterol). Phase 2b (GOLDEN) results were published online in Gastroenterology in February 2016 and will be fully available in the paper version in May 2016. As of February 2016, elafibranor has completed 8 clinical trials and a phase III is in progress. Efficacy on histological NASH parameters (steatosis, inflammation, fibrosis) in animal disease models — anti-fibrotic activities. The absence of safety concern has been confirmed in a full toxicological package up to 2-year carcinogenicity studies and cardiac studies (in mice). 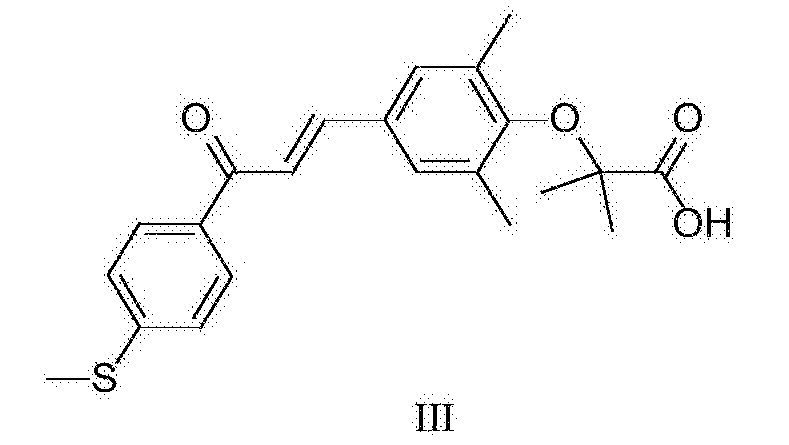 This compound was synthesized from 1-[4-methylthiophenyl]-3-[3,5-dimethyl-4-isopropyloxycarbonyldimethylmethyloxyphenyl]prop-2-en-1-one (compound 28) according to general method 5 described earlier. Purification was made by chromatography on silica gel (elution: dichloromethane/methanol 98:2). 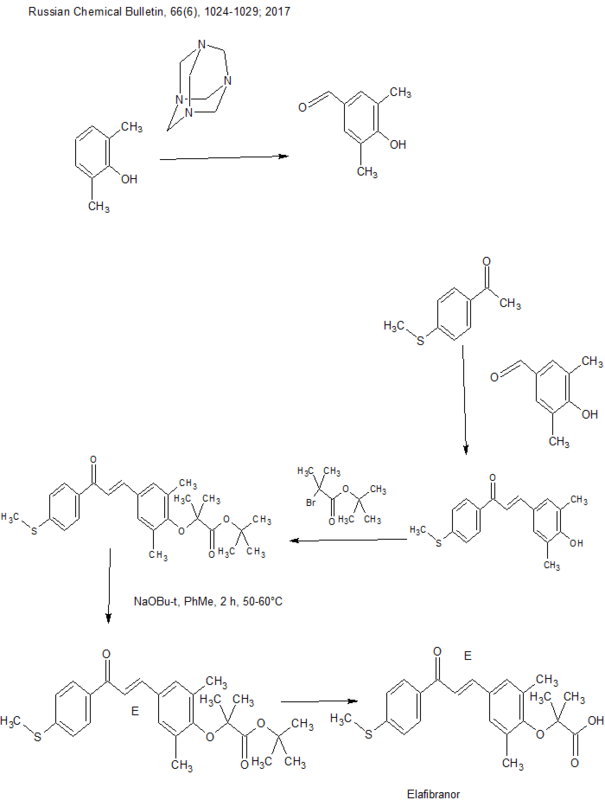 1H NMR DMSO-d6 δppm: 1.39 (s, 6H), 2.22 (s, 6H), 2.57 (s, 3H), 7.40 (d, J=8.55 Hz, 2H), 7.57 (s, 2H), 7.62 (d, J=15.5 Hz, 1H), 7.83 (d, J=15.5 Hz, 1H), 8.1 (d, J=8.55 Hz, 2H), 12.97 (s, 1H). The liver is one of the most important organs of the body, is one of the highest organ of risk. Many factors can lead to liver disease. For example, drinking too much can lead to cirrhosis, excessive medication can lead to liver damage and even obesity can lead to fatty liver. Thus, the pharmaceutical treatment of fatty liver diseases has become a hot spot of bio-pharmaceutical development. French Genf biopharmaceutical company said recently that the US Food and Drug Administration has agreed to continue the development of peroxisome proliferator-activated receptor α / δ dual agonist GFT505, and begin Phase IIb study in the United States. GFT 505 is expected to rule early diagnosis of fatty liver, heart disease and its complications, prevention and treatment of diabetes-related lipid hyperlipidemia. French Food and Drug Administration approval to a detailed in-depth far for preclinical and clinical data were analyzed based. Experts expressed the Authority, GFT505 to ensure safe operation and research and can lead to liver cancer or liver cirrhosis related biomarkers all favorable. GFT505 structure as shown in formula III. 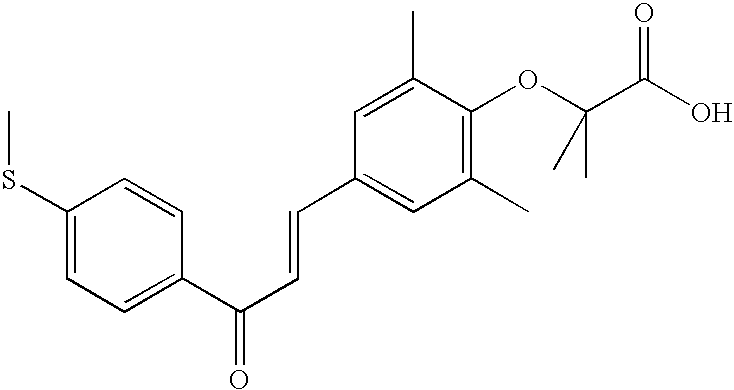 GFT505 Intermediate I is a key intermediate GFT505III, the existing technology (e.g., Patent Document 1 ^ 1 ^ 20060142611 or 20050176808) are synthesized by the method of 4-methylthio-acetophenone and 3,5 dimethyl-4-hydroxybenzaldehyde GFT505 condensation of intermediate IV, with 2-bromo-iso-butyric acid tert-butyl ester obtained. Process GFT505 Intermediate I Z double bond configuration is a type, but the 4-methylthio-acetophenone and 3,5_-dimethyl-4-hydroxybenzaldehyde condensation process, the formation of a double bond, it is difficult GFT505 avoid intermediate IV of formula Z, E mixtures of formula, and then 2-bromo-iso-butyric acid tert-butyl ester to give GFT505 intermediate II, R is also of formula Z, E mixtures of formula. E-isomer and Z-type polarity very close to the crystallization purification difficult, very precise product by column chromatography is not suitable for industrial production. 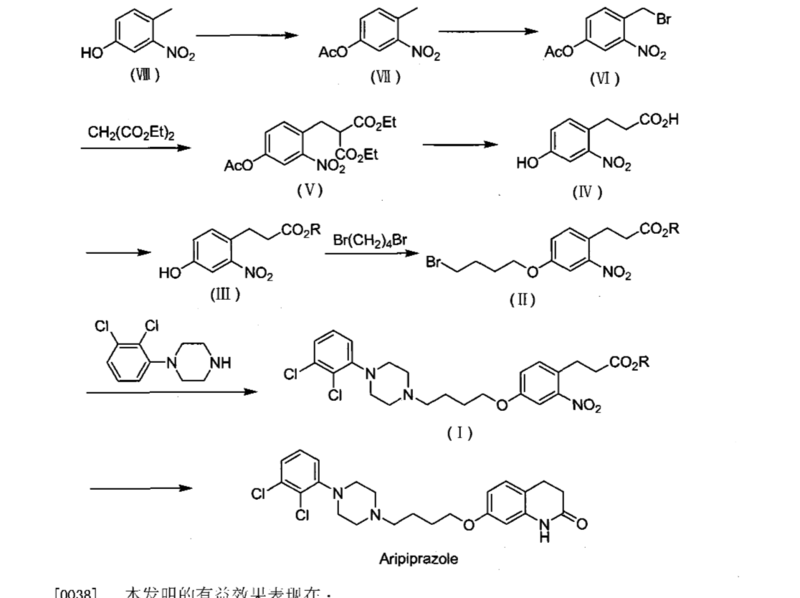 Accordingly, a need to find an efficient synthesis, reducing the content of Z-isomer impurities to improve the purity and yield of the products, and to avoid use of column chromatography purification process difficult industrialization. In reaction I of the preparation of intermediates GFT505, the organic solvent is preferably a protic solvent, a polar aprotic organic solvent non-polar solvent, more preferably a non-polar solvent. The protic solvent is preferably & ~ (: 4 alcoholic solvent; the & ~ (: t-butanol 4 alcoholic solvent preferably the polar aprotic organic solvent is preferably C 1-C4 nitrile solvents, &. ~ C6 ketone solvents, C1-C4 one or more 4 sulfone amide solvents and C1-C solvent. C1-C4 of the nitrile solvents preferably acetonitrile. the C 1-C6 ketone solvent preferably acetone and / or methyl isobutyl ketone. C1-C4 of the amide-based solvent is preferably N, N- dimethylformamide. C 1-C4 of the sulfone solvent is preferably dimethylsulfoxide. the said nonpolar solvent is preferably aromatic hydrocarbon solvent; the aromatic hydrocarbon solvent preferably toluene. A mixture of 4-mercapto-acetophenone (50g, 0.30 Imo 1), 3,5- dimethyl-4-hydroxybenzaldehyde (45g, 0.30 Imo 1) was added to a methanol solution of hydrogen chloride in 200ml (4moI / L) , 20 ~ 30 ° C for 3 hours, cooled to 0 ~ 10 ° C, stirred for 1 hour, filtered and dried to give 83g GFT505 intermediate (IV) as a yellow solid in 93% yield. 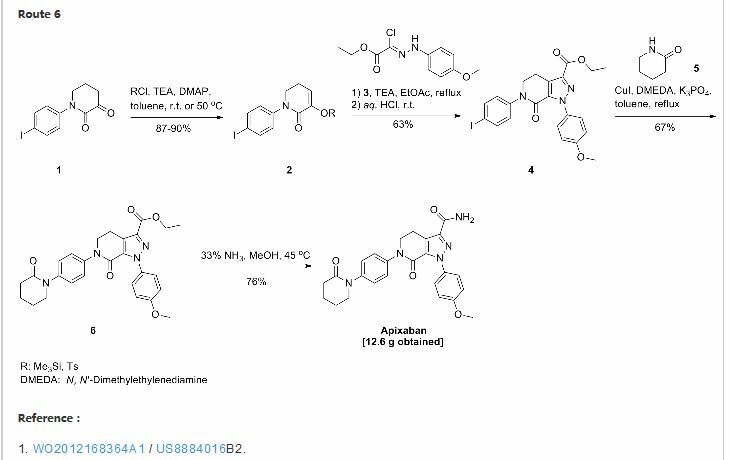 A mixture of 4-mercapto-acetophenone (I 9Kg, 114mo 1), 3,5- dimethyl-4-hydroxybenzaldehyde (I 7.1Kg, 114mo 1) was added to a methanol solution of hydrogen chloride in 76L (4mol / L ), 20 ~ 30 ° C for 3 hours, cooled to 0 ~ 10 ° C, stirred for 1 hour, centrifuged, 40 ° C and dried under vacuum for 12 hours to obtain 31.6Kg GFT505 intermediate (IV) as a yellow solid, yield 93% . LCMS: m / z = 299 (M + H) +. Compound II (81 · lg, 0.184mol) was added to 400g of toluene, cooled to 10 ~ 20 ° C, was added sodium tert-butoxide (26.8g, 0.279mol), heated to 50 ~ 60 ° C for 2 hours , 400g of water was added, layers were separated, washed with water, the organic phase concentrated to dryness under reduced pressure, methanol was added to 200ml, cooled to 0-10 ° C, stirred for 1 hour, filtered, 40 ~ 50 ° C (-0 · 08MPa ~ -0 · IMPa ) was dried in vacuo for 12 hours to give a yellow solid 78.8g GFT505 intermediate I, a yield of 97.0% APLC: 99.23% (in terms of E-form, Z configurational isomers accounted for 0.085%, largest other single impurity 0.41%). Compound II (31Kg, 70.5mol) was added to 153Kg of toluene, cooled to 10 ~ 20 ° C, was added sodium tert-butoxide (10 · 3Kg, 107mol), warmed to 50 ~ 60 ° C for 2 hours, 160Kg of water, layered, and water IOOKg IOOKg mass concentration of the aqueous solution was washed with 10% sodium chloride (the concentration refers to the percentage by mass of the total mass of sodium chloride aqueous solution), 40 ~ 50 ° C Save concentrated under pressure to slowly distilled off, methanol was added to 60Kg, cooled to 0 ~ 10 ° C, stirred for 1 hour, centrifuged, washed with methanol 20Kg, 40 ~ 50 ° C (-0.08MPa ~ -0.1 MPa) was dried under vacuum for 12 hours to give 30.4 Kg GFT505 yellow solid intermediate I, 1.0 yield 98%. LC-MS: m / z = 441 (M + H) +; HPLC: 99 · 50% E configuration similar terms, Z configurational isomers accounted for 0.082%, largest other single impurity of 0.32%. The compound II (8.0g, 0.018mol) was added to 64g tert-butanol, cooled to 10 ~ 20 ° C, was added potassium tert-butoxide (6.05g, 0.054mol), heated to 70 ~ 80 ° C Reaction 4 to 5 hours, was added 200g of water, 60g extracted twice with isopropyl acetate, and the organic phase concentrated to dryness under reduced pressure, methanol was added 20ml, cooled to 0-10 ° C, stirred for 1 hour, filtered, 40 ~ 50 ° C (_ 0.08MPa ~ -0.1 MPa) was dried in vacuo for 12 hours to give 7.62g yellow solid GFT505 intermediate I, a yield of 95.2% dHPLC: 99.36% (in terms of E-form, Z configurational isomers accounted for 0.079%, single largest other 0.42% impurities). 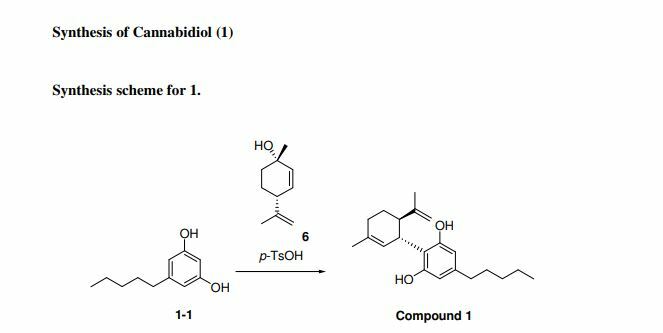 Compound II (8.Og, 0.018mo 1) was added to 16g N, N- dimethylformamide, cooled to 10 ~ 20 ° C, was added sodium tert-butoxide (2.17g, 0.023mol), heated to the reaction 90 ~ 100 ° C for 1-2 hours, was added 100g of water, 60g extracted twice with isopropyl acetate, the organic phase concentrated to dryness under reduced pressure, methanol was added 20ml, cooled to O-HTC, stirred for 1 hour, filtered, 40 ~ 50 ° C (-0.08MPa ~ -0 IMPa.) 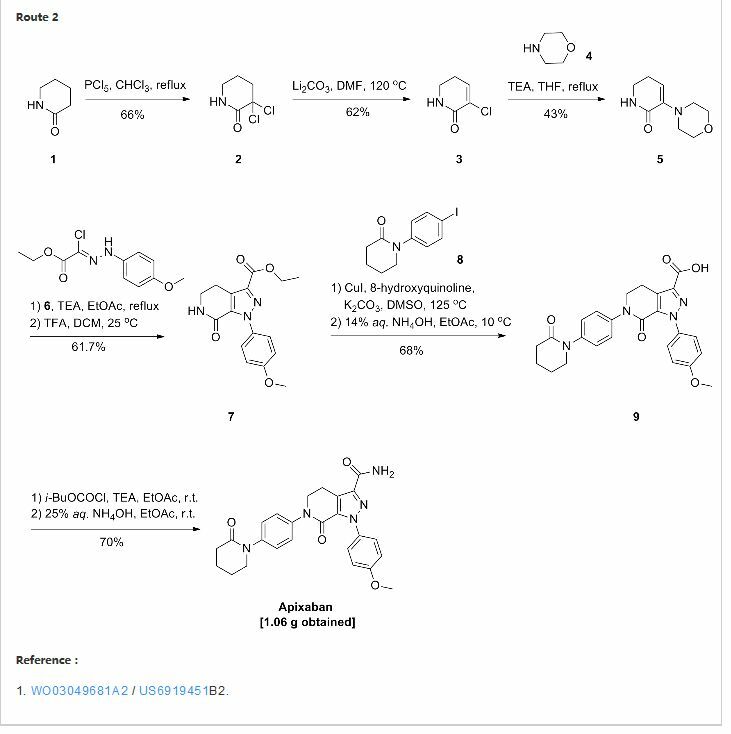 was dried in vacuo for 12 hours to give 7.34g yellow solid GFT505 intermediate I, a yield of 91.7% APLC: 99.21% E configuration similar terms, Z configurational isomers accounted 0.097%, the largest single other impurities 0.48%). The compound II (8.0g, 0.018mol) was added to 160g of acetonitrile, cooled to 10 ~ 20 ° C, was added lithium t (7.21g, 0.090mol) butanol, warmed to 40 ~ 50 ° C the reaction 9-10 hours, was added 160g of water, 90g extracted twice with isopropyl acetate, and the organic phase concentrated to dryness under reduced pressure, methanol was added 20ml, cooled to 0-10 ° C, stirred for 1 hour, filtered, 40 ~ 50 ° C (_ 0.08MPa ~ -0.1 MPa) was dried in vacuo for 12 hours to give 7.29g yellow solid GFT505 intermediate I, a yield of 91.1% dHPLC: 99.16% (in terms of E-form, Z configurational isomers accounted for 0.089%, largest other single impurity 0.49 %). The compound II (8.0g, 0.018mol) was added to 28g of dimethyl sulfoxide, cooled to 10 ~ 20 ° C, was added potassium t-butoxide (5.04g, 0.045mol), heated to 60 ~ 70 ° C the reaction 3 to 4 hours, was added 100g of water, 60g extracted twice with isopropyl acetate, and the organic phase concentrated to dryness under reduced pressure, methanol was added 20ml, cooled to O-UTC, stirred for 1 hour, filtered, 40 ~ 50 ° C (_ 0.08 MPa ~ -0.1 MPa) was dried in vacuo for 12 hours to give 7.33g yellow solid GFT505 intermediate I, a yield of 91.6% dHPLC: 99.46% (in terms of E-form, Z configurational isomers accounted for 0.077%, largest single impurity other 0.27%). The GFT505 Intermediate I (77.9g, 0.177mol, may be prepared as described in Example 10) was added to the reaction flask was added 790g of dichloromethane was added trifluoroacetic acid (209.7g, 1.84mol), 20 ~ 30 ° C the reaction for 5-6 hours, concentrated to dryness, was added 600ml ethyl acetate and 600ml of water, layers were separated, washed with water, dried over anhydrous sodium sulfate, filtered, concentrated to a small volume the organic phase, 10-20 ° C for 2 hours crystallization, filtration, under -0.08MPa ~ -0.1 MPa, 40 ° C ~ 50 ° C was dried in vacuo 12 hours to give 60.1 g as a yellow solid. 25〇1 yellow solid was recrystallized from ethyl acetate to give 52.98 ^ as a yellow solid 6? 505 (111), a yield of 77.8%. 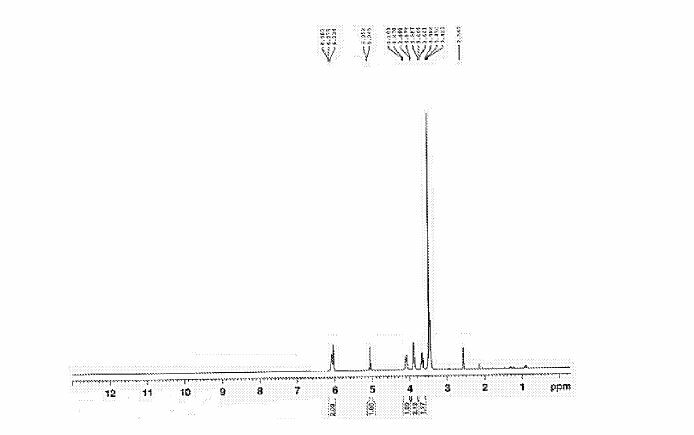 LC-MS: m / z = 385 (M + H) +; HPLC: 99 · 86%, largest single impurity 0.5 06%. The GFT505 Intermediate I (30Kg, 68.2mol, may be prepared as described in Example 9) was added to 307Kg dichloromethane was added trifluoroacetic acid (80.8Kg, 709mol), 20-30 ° C the reaction 5-6 h, concentrated to dryness, ethyl acetate and water 197Kg 231Kg, layered, and water IOOKg IOOKg concentration of 10 mass% aqueous sodium chloride concentration (which refers to the quality of the aqueous solution of sodium chloride percentage of total mass) washing, 40 ~ 50 ° C to about 80Kg concentrated under reduced pressure, cooled to IO ~ 20 ° C for 2 hours crystallization, centrifugation was washed with ethyl acetate 20Kg, at -0.08MPa ~ -O.IMPa, 40 ~ 50 ° C was dried in vacuo for 12 hours to give a yellow solid was 23.2Kg. As a yellow solid was obtained as a yellow solid GFT505III 20.9Kg 82Kg recrystallized from ethyl acetate, 5.8 79% yield. LCMS: m / z = 385 (M + H) +; HPLC: 99 · 95%, largest single impurity 0.5 03%. Jump up^ Cariou, B.; Zair, Y.; Staels, B.; Bruckert, E. (2011). “Effects of the New Dual PPAR / Agonist GFT505 on Lipid and Glucose Homeostasis in Abdominally Obese Patients with Combined Dyslipidemia or Impaired Glucose Metabolism”. Diabetes Care. 34 (9): 2008–2014. doi:10.2337/dc11-0093. PMC 3161281  . PMID 21816979. Jump up^ “International Nonproprietary Names for Pharmaceutical Substances (INN). Recommended International Nonproprietary Names: List 74” (PDF). World Health Organization. p. 10. Retrieved 9 November 2016. Jump up^ “Advanced Compound Status” (Press release). Genfit. Jump up^ “GFT505 Broadens Its Therapeutic Potential” (PDF) (Press release). Retrieved 31 Mar 2013. Jump up^ Cariou, Bertrand; Staels, Bart (2014-10-01). “GFT505 for the treatment of nonalcoholic steatohepatitis and type 2 diabetes”. Expert Opinion on Investigational Drugs. 23 (10): 1441–1448. 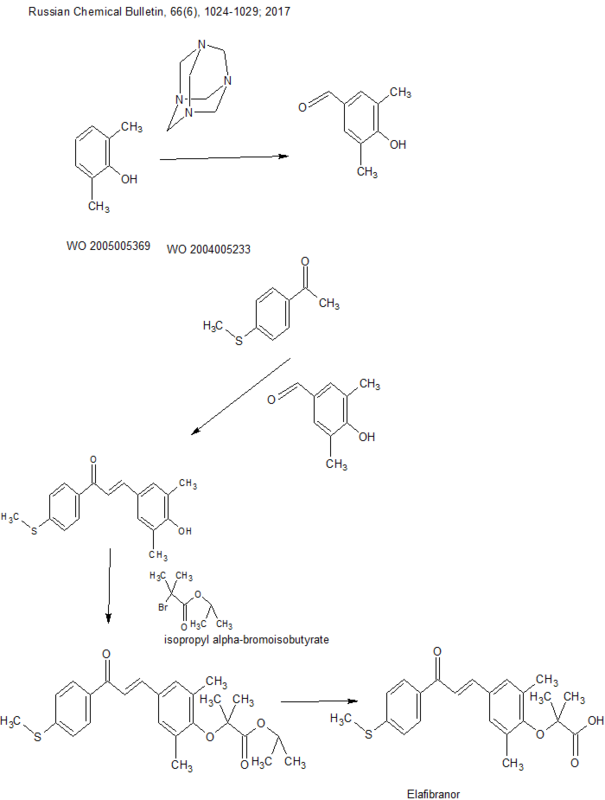 doi:10.1517/13543784.2014.954034. ISSN 1744-7658. PMID 25164277. Jump up^ US Patent No. 7655641 “96 dpi image of original patent USPTO 7655641” (PDF). Retrieved 31 Mar 2013. Jump up^ Staels, Bart; Rubenstrunk, Anne; Noel, Benoit; Rigou, Géraldine; Delataille, Philippe; Millatt, Lesley J.; Baron, Morgane; Lucas, Anthony; Tailleux, Anne (2013-12-01). “Hepatoprotective effects of the dual peroxisome proliferator-activated receptor alpha/delta agonist, GFT505, in rodent models of nonalcoholic fatty liver disease/nonalcoholic steatohepatitis”. Hepatology. 58 (6): 1941–1952. doi:10.1002/hep.26461. ISSN 1527-3350. Jump up^ Cariou, Bertrand; Hanf, Rémy; Lambert-Porcheron, Stéphanie; Zaïr, Yassine; Sauvinet, Valérie; Noël, Benoit; Flet, Laurent; Vidal, Hubert; Staels, Bart (2013-05-28). “Dual Peroxisome Proliferator–Activated Receptor α/δ Agonist GFT505 Improves Hepatic and Peripheral Insulin Sensitivity in Abdominally Obese Subjects”. Diabetes Care. 36: DC_122012. doi:10.2337/dc12-2012. 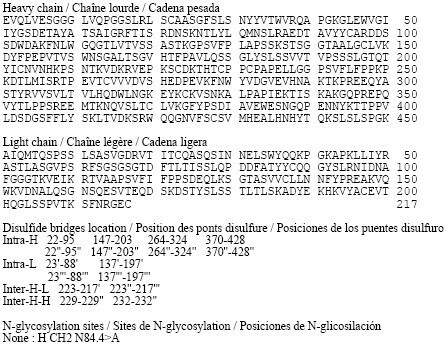 ISSN 0149-5992. PMC 3781493  . PMID 23715754. Jump up^ “Elafibranor, an Agonist of the Peroxisome Proliferator-activated Receptor-α and -δ, Induces Resolution of Nonalcoholic Steatohepatitis Without Fibrosis Worsening – Gastroenterology”. http://www.gastrojournal.org. Retrieved 2016-03-08. Jump up^ Quintero, Pablo; Arrese, Marco (2013-12-01). “Nuclear control of inflammation and fibrosis in nonalcoholic steatohepatitis: therapeutic potential of dual peroxisome proliferator-activated receptor alpha/delta agonism”. Hepatology. 58 (6): 1881–1884. doi:10.1002/hep.26582. ISSN 1527-3350. PMID 23787705. Jump up^ Hanf, Rémy; Millatt, Lesley J.; Cariou, Bertrand; Noel, Benoit; Rigou, Géraldine; Delataille, Philippe; Daix, Valérie; Hum, Dean W.; Staels, Bart (2014-11-01). “The dual peroxisome proliferator-activated receptor alpha/delta agonist GFT505 exerts anti-diabetic effects in db/db mice without peroxisome proliferator-activated receptor gamma-associated adverse cardiac effects”. Diabetes & Vascular Disease Research. 11 (6): 440–447. doi:10.1177/1479164114548027. ISSN 1752-8984. PMID 25212694. By DR ANTHONY MELVIN CRASTO Ph.D in FAST TRACK FDA, Phase3 drugs on May 28, 2018 .